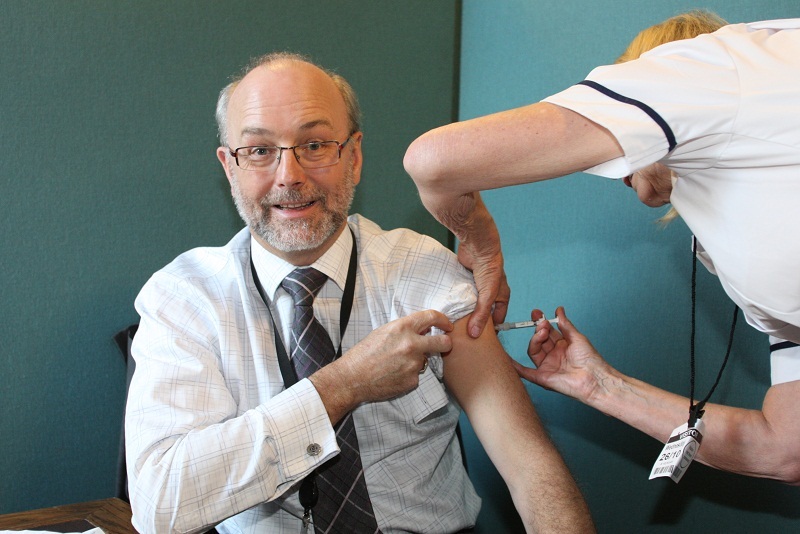 Local MP Alex recently attended a flu vaccine clinic to encourage his constituents to get this season’s flu vaccine. Last year, 72.4% of people over 65 and 48.1% in the ‘at risk’ groups were vaccinated against flu in Stockton-on-Tees, compared with the national averages of 72.8% for the over 65s and 50.4% for those ‘at risk’. The Department of Health provides free seasonal flu vaccinations for at risk groups, which include those aged 65 or over; people with chronic respiratory disease (including asthma), heart, renal, liver or neurological disease; diabetes; low immune systems; as well as people living in long-stay facilities such as nursing and residential homes, and carers of elderly or disabled people. The initiative is sponsored by the UK Vaccine Industry Group (UVIG) and is supported by the Department of Health as a useful way to highlight the importance of flu vaccination.